Award-winning Philadelphia criminal lawyers for Receiving Stolen Property charges in PA and NJ. Philadelphia criminal defense lawyer Zak T. Goldstein, Esq. explains the crime of Receiving Stolen Property and some of the defenses to Receiving Stolen Property charges in Pennsylvania. If you are under investigation or facing criminal charges, call 267-225-2545 to speak with an award-winning criminal defense lawyer today. The criminal defense lawyers of Goldstein Mehta LLC have successfully defended countless cases involving Receiving Stolen Property charges. If you are facing any type of theft charge, call 267-225-2545 for a free criminal defense strategy session. We are dedicated professionals who understand what you're going through, care about you and your case, and will use our skill and experience to help. Receiving Stolen Property ("RSP"), is a very common theft charge which is often brought in Philadelphia state court. The gradation of the charge may range from a summary offense to a first degree felony depending on the type and value of the property involved. It is extremely common to see RSP charged when the property involved is a stolen car or motor vehicle of some kind, and the charge is always graded as a felony of the third degree when the case involves a stolen automobile or other type of motor vehicle. Prosecutors often bring these charges when the defendant is found in possession of a stolen gun, but it is extremely difficult for the Commonwealth to prove that the defendant knew the gun was actually stolen. In general, RSP involves taking possession of property belonging to someone else knowing that the property was stolen or believing that it was probably stolen. RSP differs from Theft by Unlawful Taking and other theft offenses in that Commonwealth need not show that the defendant is the person who originally stole the property from its rightful owner. Instead, in order to prove its case, the Commonwealth must show only that the defendant possessed the property of someone else without permission and the defendant either knew the property was stolen or believed that it was probably stolen. Our Philadelphia Criminal Defense Lawyers offer a 15-minute, complimentary criminal defense strategy session. We know that picking up the phone and calling an attorney can be intimidating, so in this video, Attorney Zak Goldstein explains what you can expect when you call us. Call 267-225-2545 to speak with one of our criminal defense lawyers. Felony of the First Degree: Receiving Stolen Property is a Felony of the First Degree when the property involved is a firearm if the Commonwealth can also show that the defendant is in the business of buying and selling firearms. It is also a Felony of the First Degree if the value of the property involved is $500,000 or more. Felony of the Second Degree: RSP is a Felony of the Second Degree if the property involved is a firearm and the defendant is not in the business of buying and selling firearms. It could also be a second degree felony if the theft offense occurs during a natural disaster or war. Felony of the Third Degree: Receiving Stolen Property charges involving property worth less than $500,000 but more than $2,000 and the illegal receipt of a Motor Vehicle are graded as a felony of the third degree. Pennsylvania does not have a crime called "Grand Theft Auto." Instead, the theft or receipt of a stolen car is typically charged as a felony of the third degree. Misdemeanor of the First Degree: RSP of property taken by force or threat or in breach of a fiduciary duty is graded as a Misdemeanor of the First Degree. Misdemeanor of the Second Degree: RSP of property worth less than $200 but more than $50 is graded as a Misdemeanor of the Second Degree. Summary Offense: When the property involved is worth less than $50 or the value cannot be determined, then the gradation of a RSP charge is that of a summary offense. As the above maximum sentences show, it is possible to receive real jail time in these cases. This is particularly true in cases involving stolen guns and cars because felonies of the third degree could result in up to seven years in jail and significant fines. At the same time, there are often defenses in these cases, and the defenses could include both challenging whether the defendant actually committed the crime as well as whether the defendant should go to jail even if convicted. Pennsylvania judges must consider the sentencing guidelines when sentencing a defendant who has been convicted of a criminal offense. The guidelines for a conviction vary tremendously depending on the value and nature of the property involved. When the offense is a felony, the guidelines are more likely to recommend jail time. However, even when the offense is a felony as charged, it may be possible to negotiate for a lesser gradation of the charge or for a probationary sentence. Depending on the case, it also may be possible to fight the charges and win. It is very common for these cases to involve allegations that the defendant was found in possession of a stolen car. The PA sentencing guidelines would permit a court to impose a probationary sentence even for a defendant who has been convicted of stealing a car in cases where the defendant does not have an extensive criminal history. For example, for a defendant with no prior record score, the offense gravity score of receiving a stolen car would be 6 points. With a prior record score of zero and an offense gravity score of 6, the sentencing guidelines would recommend a minimum jail sentence of 3-12 months plus or minus 6 months. This means that if the defendant can present sufficient mitigation evidence at sentencing, the court would be justified in imposing a probationary sentence. This means that jail time is not always required even if the case is likely to result in a conviction, and in many cases, there may be defenses to the charges. Given the nature and value of the property involved, these cases can be very serious. However, there are often defenses to theft charges, and our experienced criminal defense attorneys can evaluate your case for potential defenses. For example, as recognized in the case of Commonwealth v. Matthews, the mere possession of stolen property or property belonging to another does not automatically mean that the possessor of that property is the person who stole or it that they knew it was stolen. This issue comes up frequently when the defendant has been arrested in possession of a car belonging to someone else. For example, the police will pull the defendant over, run the license plate on the car, and receive information from NCIC that the car has been reported stolen. Regardless of whether the defendant has a reasonable explanation for being in possession of the car, the police will often then charge the driver with Receiving Stolen Property and Unauthorized Use of an Automobile. In this situation, there may be strong defenses to the RSP count. The Matthews case clearly establishes that simply possessing the car is insufficient because the statute also requires the defendant to have known that the car was stolen or believed that it was probably stolen. In determining whether the defendant possessed the requisite knowledge, the court must evaluate the "Matthews factors." These factors include things like whether there is damage to the ignition, the amount of time since the car was reported stolen, and whether the defendant has a reasonable explanation for possessing the car. Alternatively, if the defendant cannot come up with an explanation or attempts to flee, then the defendant is going to be in worse shape when a court considers the factors. Likewise, the case against the defendant will be much weaker if the car was operated with keys and there was no damage to the ignition. All of these factors and a number of others must be considered in order for the prosecution to show that the defendant actually knew the car was stolen and that he or she did not have permission to drive it. Without evidence of guilty knowledge, the Commonwealth simply cannot prove criminal behavior beyond a reasonable doubt. Although Matthews dealt with a stolen car, the factors from that case apply to any type of stolen property because of RSP's requirement that the Commonwealth show guilty knowledge. This means that the Matthews factors apply to stolen property like guns, computers, and jewelry. Unless there is something about the property or the defendant's behavior which indicates that the defendant knew or suspected the property as stolen, then the prosecution may have great difficulty in proving its case. The valuation of the property is also extremely important in these cases. Pennsylvania law provides a wide range of potential gradations for theft charges based on the value of the property. Specifically, the fact that RSP becomes a felony when the property is worth more than $2,000 is significant because it is often possible to show that the property was not really worth that amount at the time that it was stolen. In that case, the charge should be graded only as a misdemeanor instead of as a felony, and the trial will be heard in the Philadelphia Municipal Court instead of the Court of Common Pleas. Our Philadelphia criminal defense lawyers may be able to use an expert witness to challenge the valuation of the property. Finally, first offense theft charges are often eligible for diversionary programs which will allow the defendant to keep a clean record like AMP and ARD. Depending on the case, our experienced criminal lawyers may be able to convince the prosecutor to drop charges or have the charges dismissed pre-trial by showing that our client did not have the requisite guilty knowledge. Alternatively, we may be able to fight the case at trial. There are still limits on the use of hearsay at the preliminary hearing in Pennsylvania. 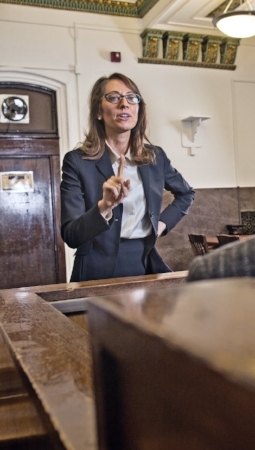 Traditionally, the rules have been that some hearsay is allowed, but the prosecution cannot meet its burden at a preliminary hearing by introducing hearsay testimony alone. In most theft and RSP cases, the Commonwealth may introduce ownership and non-permission testimony, which is an element of any theft crime, through the use of hearsay. This rule often allows the prosecution to meet its burden at a preliminary hearing without having to call any civilian witnesses. The rule allows the police, who are professional witnesses and are paid to show up to court, to provide all of the necessary testimony. For example, where the police pull a defendant over in a stolen car, they would call the owner of the car and ask if the owner definitely owned the car and if the owner had given the defendant permission to borrow the car. Assuming the owner of the car tells an officer or detective that the defendant did not have permission to borrow the car, the courts will typically allow the officer or detective who obtained that information to provide it at the preliminary hearing by introducing an ownership and non-permission ("ONP form"). This form identifies the registered owner of the automobile and indicates that the defendant did not have permission to drive that vehicle. More recently, the Superior Court has gone beyond ONP and allowed even more hearsay to be introduced at preliminary hearings. The Supreme Court has not yet approved of this practice, but it declined to reverse the Superior Court's decision in Commonwealth v. Ricker. However, the Supreme Court did recently grant review in a different case as to whether constitutional due process protections prohibit the Commonwealth from proceeding based on hearsay alone at a preliminary hearing. The Court has not yet ruled in that case. Accordingly, many Municipal Court judges and Magisterial District Justices, particularly in Philadelphia, will dismiss a case at the preliminary hearing where the Commonwealth has nothing more than hearsay. In this case, R.P. was charged with Receiving Stolen Property, Theft by Unlawful Taking, Burglary, and related charges after police pulled him over as he exited a property that was under renovation. The officer stopped R.P. and his passenger as they began to drive away. The officer testified that without entering the car, the officer observed copper piping in the back of the vehicle that the defendants were in. The officer also testified that R.P. told him that R.P. had been "scrapping." The arresting officer confirmed that the property from which R.P. exited was often the target of burglary attempts and that it was not well secured. It had even been the target of an attempted burglary earlier that day. The Commonwealth then asked to introduce an ownership and non permission form stating that R.P. did not have permission to enter the property. The owner of the property, however, had not signed the actual form. On cross-examination, Attorney Goldstein established that the arresting officer did not know whether the copper piping actually came from inside the property. The officer had not entered the building to see if he could determine from where the piping came. Likewise, because the property had been subjected to repeated burglary attempts, the officer could not testify that the damage to the back door was caused by the defendant. With no evidence that the piping came from the property or that the defendant ever actually went inside, the judge promptly dismissed all of the charges at the end of the preliminary hearing. The judge sustained a number of objections to the Commonwealth's overreliance on hearsay. The judge also found that the evidence was insufficient and that any indication on the ONP form that R.P. had entered the property was hearsay. This was in part due to the fact that the owner of the property had not even bothered to sign the form. Accordingly, the entire case was dismissed. The Philadelphia Criminal Defense Attorneys of Goldstein Mehta LLC have had significant success defending all types of theft cases. We recognize the issues in these cases and know how to defend these charges. RSP cases are often heard in the Philadelphia Municipal Court, and we have tried hundreds, if not thousands, of cases in that venue. However, even when charged as a misdemeanor, RSP charges are extremely serious due to the potential for damage to a defendant's career and employability. Therefore, if you or a loved one are facing theft charges in Philadelphia or the surrounding counties, call 267-225-2545 today for a complimentary criminal defense strategy session with one of our attorneys. (a) Offense defined.--A person is guilty of theft if he intentionally receives, retains, or disposes of movable property of another knowing that it has been stolen, or believing that it has probably been stolen, unless the property is received, retained, or disposed with intent to restore it to the owner. (b) Definition.-- As used in this section the word "receiving" means acquiring possession, control or title, or lending on the security of the property.